What is an automatic water sampler? What is the difference between manual and automatic sampling? What are the different components of an automatic water sampler? What are the different types and characteristics of automatic water samplers? An automatic water sampler collects samples from a water source without requiring human intervention each time a sample is needed. Samplers can be programmed to collect samples at different intervals for different durations. The collected water samples can be evaluated immediately onsite, or they can be stored and transported to a facility's laboratory for analysis. Facilities in many industries use automatic water samplers to help meet their required water quality standards. These facilities have seen a trend in recent years toward more heavily regulated water quality governance, more detailed permit requirements, and more thorough water sampling documentation. By efficiently collecting and preserving water samples, automatic water samplers help provide accurate water quality data. This data aids facilities in making more informed decisions. Ultimately, these decisions can affect the safety and health of humans and other organisms that depend on water as a vital resource. Before reviewing the different types of automatic water samplers, it may be helpful to first understand how automatic water sampling is different from manual water sampling. Manual sampling, sometimes referred to as performing a "manual grab," requires minimal equipment. Low-tech manual sampling is done by simply placing a sample container into a water source, or its flow, and collecting a sample. Manual sampling can be a cost-effective solution for a facility with short-term monitoring programs or very infrequent sampling. Facilities that conduct frequent sampling in multiple, distant locations often find manual sampling to be inconvenient. Manual sampling requires trained sampling personnel to be available to collect samples. In addition, some site environments pose safety concerns to sampling personnel. In these situations, facilities often prefer automatic sampling. Automatic sampling uses a preprogrammed powered water sampler to collect water samples on a time-based or event-triggered schedule. For example, a water sampler can be programmed to collect water samples every day at 6 a.m. and 6 p.m. (time based), or a sampler can be programmed to start sampling every time rain begins to fall (event triggered). Because of the ability to program the sampling and the convenience offered, automatic sampling is often preferred to manual sampling. Automatic sampling offers the convenience of unattended, long-term monitoring, thereby reducing the time and cost associated with frequent manual sampling. In addition, automatic sampling minimizes the possibility of human error in sample collection. Automatic water samplers vary considerably in their technology and application, but they share the same components. These components are briefly described in the following sections. The controller, or "brain" of the water sampler, is used to program and control the sampler. The controller usually has a keypad for programming the sampler and an LCD for providing status feedback. The pump system moves fluid from the water source into the water sampler to collect the samples. Water samplers commonly use either a peristaltic or vacuum pump. Sample containers hold water samples until they are evaluated or analyzed. 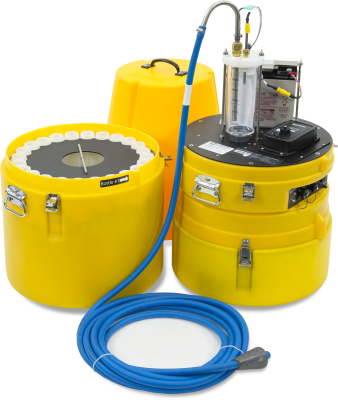 A water sampler may deposit samples into a single sample container (composite sampling) or into individual sample containers (discrete sampling). If samples must be chilled, a portable sampler's cooling chamber or a stationary sampler's refrigerator is used. Automatic water samplers use either peristaltic pump or vacuum pump technology. Both pump technologies move fluid from the water source into the water sampler so that the fluid can be collected. The pump rotates in the reverse direction. By pumping air through the system, the pump cleans the intake tubing of residual liquid and obstructions. 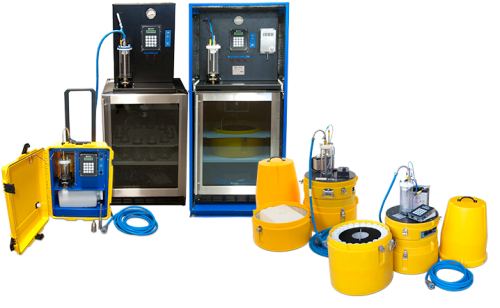 Alternatively, personnel can manually switch the intake tubing from the water source to a container of clean rinsing water to purge the line. They can then switch the intake tubing back to the water source. The pump rotates in the forward direction and pumps fluid from the water source into the intake tubing. 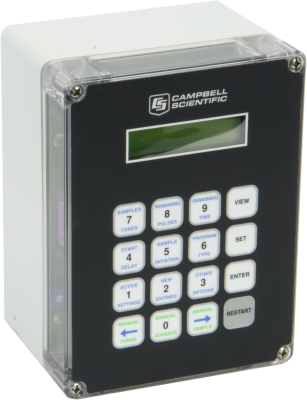 As the controller detects the fluid in the intake tubing, the controller determines how many pump revolutions, or "pump counts," are required to attain the programmed sample volume. To reach the required sample volume, the pump rotates forward for each pump count. Each time the pump rotates forward, the pump tubing is squeezed to move the fluid along. As the required pump counts are completed, the sample is deposited in the sample container. Typically, a peristaltic pump sampler requires less power to run than a vacuum pump sampler. Because no wires stick out from a peristaltic pump sampler, the sampler has a tidy appearance. Peristaltic pump samplers may be less expensive than vacuum pump samplers. Repeatedly squeezing the tubing to move the fluid through a peristaltic pump sampler causes the tubing to wear out, the squeezing to become less tight, and the sample volumes to vary. Consequently, a precise sample volume cannot be guaranteed from one sample to the next. When the pump tubing is squeezed in a peristaltic pump sampler, any suspended solids in the sample can be squeezed, and altered, as well. The solids can also stick to the lining of the tubing. Thus, the sample may not be truly representative of the water source at the time of sampling. Many peristaltic pump samplers are not compatible with larger tubing. When smaller tubing is used, it can become blocked by any large suspended solids in the fluid, or the large solids may be screened out. Peristaltic pump samplers typically provide less velocity than vacuum pump samplers. With less velocity, particles are not held in suspension as well and may settle, causing the water sample to not be truly representative of the water source. A non-invasive, high-pressure purge of air is used to clean the intake assembly of residual liquid and obstructions. 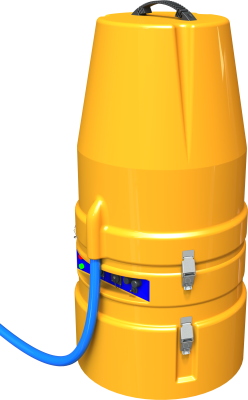 Using the vacuum, fluid from the water source is drawn through the intake hose and into the metering chamber. After the metering chamber is filled, the system is pressurized. Excess fluid is released until the correct sample amount is obtained. The sample, now at its correct volume, is deposited into the sample container. A vacuum pump sampler's metering chamber helps ensure that sample volumes are precise and repeatable from sample to sample. If the control volume is set at a level that does not greatly exceed the required sample volume, the suspended particles do not settle and affect the sample's representativeness of the water source. Because the tubing in a vacuum pump sampler is not squeezed repeatedly, it does not wear out as quickly as the tubing in a peristaltic pump sampler. In addition, because there is no squeezing, any suspended solids in the fluid are not altered. Unlike peristaltic pump samplers, vacuum pump samplers are typically compatible with larger tubing. Larger tubing allows larger suspended solids to pass through. Smaller tubing, on the other hand, may become blocked by larger solids. Compared to peristaltic pump samplers, vacuum pump samplers typically provide greater velocity. Greater velocity holds particles in suspension better and provides a more representative sample. The cleansing air pumped through a vacuum pump sampler is under higher pressure than the air pumped through a peristaltic pump sampler. The higher-pressure air may provide more thorough cleaning and less chance of residual liquid from a previous sample. Typically, a vacuum pump sampler requires more power to run than a peristaltic pump sampler. Automatic water samplers can collect either composite or discrete samples over time. In composite sampling, individual sample volumes are deposited into a single large sample container. In discrete sampling, individual sample volumes are deposited into individual small sample containers. Composite sampling can provide a representative water sample for a certain period. Over time, a composite sampler deposits individual sample volumes into a single large sample container. The size of the sample container can vary. For example, a composite sampler could be used with a single 9 L container or a single 20 L container. A composite sampler is able to produce a water sample that represents the average water quality for a specified period. A composite sampler is less expensive than a discrete sampler. Because multiple water samples in a composite sampler are combined in a single sample container, sampling personnel cannot pinpoint and track changes in a water source as precisely as with a discrete sampler. Discrete sampling is used to acquire multiple, distinct water samples over time. A discrete sampler deposits each sample volume into its own separate sample container. A stepper with distributor arm rotates among the sample containers and fills them one at a time. The sample containers used in a discrete sampler are available in a variety of sizes, but a discrete sampler typically contains a set of sample containers that are uniform in size. For example, a discrete sampler could use a set of 0.5 L containers, a set of 1 L containers, or a set of 2 L containers. Because the space to hold the sample containers is finite, either many smaller containers or fewer larger containers can be used. A variation on discrete sampling is multi-composite sampling. Multi-composite sampling uses a discrete sampler to deposit multiple sample volumes into a single sample container. The distributor arm then rotates to fill the next container in the same manner. Because water samples in a discrete sampler are kept separate, sampling personnel can more precisely pinpoint and track changes in a water source than they can using a composite sampler. Because of the multiple sample containers used, a discrete sampler requires more maintenance to collect, clean, and change out the sample containers. A discrete sampler is more expensive than a composite sampler. Automatic water samplers are either portable or stationary. A portable water sampler can be moved easily from one site location to another. A stationary water sampler is designed to remain at a fixed installation. Both types of water samplers can be used to collect either composite or discrete samples. As the term "portable" implies, a portable sampler is one that can be moved easily from one sampling site to another. (If required, however, a portable sampler can remain at a single site.) Because of their smaller size, portable samplers may also be used at space-restricted locations. A portable sampler can be moved easily among multiple sites that require infrequent sampling. Portable samplers are smaller and weigh less than stationary samplers. Portable samplers may be appropriate for sampling sites that have space restrictions, such as manholes, or sites that require strapping a water sampler to a pole. Because a portable sampler requires less power than a stationary sampler, a portable sampler may be able to use solar power, batteries, or both. Because a portable sampler uses ice rather than a refrigerator to chill samples, samples cannot be kept chilled for an extended period without frequent replacement of the ice. Consequently, sampling personnel need to replace the ice routinely or retrieve the samples before their temperature increases significantly due to ice melt. If a portable sampler is inactive for extended periods, an additional power source may be needed to ensure future sampling operation. Because of its portability, a portable sampler may be stolen. As the term "stationary" implies, a stationary sampler is designed to remain at a particular sampling site for an extended period. Although a stationary sampler is often considered a permanent fixture, it can be moved from a site. A stationary sampler can be equipped with a locked cabinet to deter tampering with the controller or sample containers. 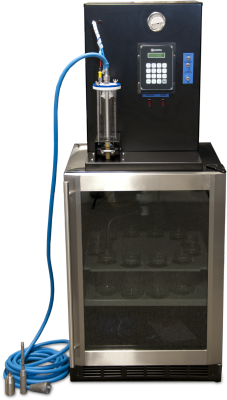 If a stationary sampler has a refrigerator (powered by an ac power source), the sampler preserves chilled samples for an extended period without the need for sampling personnel to replace ice. A stationary sampler can be left unattended, at a site that requires frequent sampling, with less likelihood that it will be stolen. A stationary sampler cannot be easily transported to many sites. A stationary sampler typically requires an ac power source. If desired, a backup battery may be used as well. Automatic water samplers may or may not be used to chill their collected water samples. Chilling options are available using either a portable or stationary sampler; however, the samplers' methods for chilling samples are different. Chilling water samples significantly reduces the rate at which chemical reactions and biological phase changes occur in the samples. Consequently, water samples are more accurate and representative of their water sources. Stationary samplers typically chill samples using a refrigerator. When a refrigerator, powered by an ac power source, is used in a water sampling system, samples can be kept chilled for months. Water samples are typically kept at a temperature of 4 degrees Celsius (39 degrees Fahrenheit). Portable samplers typically chill samples using ice placed in a cooling chamber. Many portable samplers are equipped with a cooling chamber in their base. The cooling chamber has an insulated cavity that can be filled with cubed or crushed ice. The use of ice can keep samples chilled for up to 24 hours prior to the samples' collection for analysis. A refrigerator or cooling chamber can help prevent samples from undergoing significant biological or chemical change due to temperature change. Consequently, the samples' integrity is maintained, providing a more accurate representation of the water source. A refrigerator or cooling chamber may be used to meet a governing body's sampling requirements for maintaining a sample at a specific temperature prior to analysis. When ice is used in the cooling chamber of a portable sampler, sampling personnel need to replace the ice or collect the samples before the samples' temperature increases significantly due to ice melt. In addition, sampling personnel may need to replace the ice in preparation for the next sampling round. A stationary sampler with a refrigerator requires an ac power source. Due to its size, a stationary sampler with a refrigerator may exceed the dimensional limitations of a sampling site. Stationary samplers without a refrigerator, as well as portable samplers used without ice, do not chill their water samples. Consequently, the water samples may be more susceptible to biological or chemical changes caused by changes in the ambient temperature. Chilling is not necessary for certain water sample substances that are unaffected by temperature changes. Chilling is also unnecessary when water sample evaluation or analysis is conducted immediately after the sample collection. When samples do not need to be chilled, it is not necessary to purchase ice or a refrigerator. If a chilling method is not used, a consistent water sample temperature may not be maintained. A change in water sample temperature may cause water samples to undergo significant biological or chemical change. Consequently, non-chilled samples may no longer serve as an accurate representation of the water source. If an external battery is replaced on an automatic water sampler, will the sampling program automatically resume? With some sampler models, the automatic sampling program will automatically resume. With other models, it may be necessary to restart the system. For details on this topic, consult the instruction manual for the particular water sampler. How can more data for water analysis be acquired? When a facility uses an automatic water sampler with a data logger, the facility has more flexibility. For example, a facility can use various sensors to take many different measurements at the same time. These measurements can be analyzed onsite, in a laboratory, or at both locations. Does replacing an external battery cause the water sampler program memory to be deleted? Replacing a battery is a quick process that will not cause the sampler to lose its programmed settings and information. The control panel has an internal battery and a small amount of memory that will preserve the information while the battery is replaced. Why might a water sampler turn on but fail to collect a sample? How can this be fixed? Remove the intake hose from the intake volume control tube. Check all air hose connections to ensure that there are no loose fittings or leaks. Check the meter chamber cover lid for proper connections. Ensure that everything is correctly installed and that the O-rings are in place. Verify that the pinch bar on the discharge tube is closing properly and not allowing vacuum or purge leakage. Check the solenoid valves on the pump to see if they are purging or vacuuming at the air tube connection of the metering chamber. If air is not purging and vacuuming from the tube at the metering chamber connection, remove the solenoid valves from the pump, and check for air pressure at the pump output port. If air pressure is present at the pump output port, replace the solenoid valves with pn 27893. If no air pressure is present at the pump output port, either rebuild the pump (if it is a large pump) with the rebuild kit pn 28620, or replace the pump (if it is a small pump). If no ac power source is available, can just one external battery power a water sampler? In a situation where a battery must be used, it is important to sustain power to the water sampler—especially when the battery begins losing a significant amount of charge. Sampling personnel need to manually replace depleted batteries with a ready supply of fully charged batteries. The frequency with which the batteries need to be replaced may be reduced by using solar panels. Solar panels are only a practical option, however, if there is enough available, consistent solar radiation at the sampling site. If it is difficult to replace the batteries, solar power is not a practical option, or the water sampling system’s power requirements are great, then a deep-cycle rechargeable battery may be a suitable option. How can the external battery voltage of the water sampler be checked? To check the external battery’s voltage, connect a metering device to the battery. Keep it connected for several seconds to allow the device to level out. If the voltage is below 12.3 Vdc, it may be necessary to recharge the battery. Does ice have to be used with a portable water sampler? It is optional to use ice in a portable water sampler. Deciding whether to use ice, and, if so, how much, depends on two things: the sampling requirements for keeping the sample chilled before analysis, and the potential for biological or chemical changes because of temperature changes. What might cause a water sampler pump to not start? How can this be fixed? Check to ensure that the voltage of the external battery is adequate. For water samplers with a large pump, the battery voltage should be greater than 12.3 Vdc. If the voltage is below 12.3 Vdc and a large pump is being used, recharge the battery to full charge. If the water sampler is a PVS-series sampler and ac power is available, keep the sampler plugged in. Remove the bottom splash plate. Tap the pump with a rubber mallet while attempting to initiate a manual sample. Check the voltage at the pump. If the voltage is below 12.3 Vdc, check the wiring to ensure that it is making contact and that no corrosion is present. As necessary, tighten the contacts, replace any broken wires, and clean off the corrosion. Recheck the voltage at the pump. If the voltage reading is greater than 12.3 Vdc and the pump continues to fail starting, the pump is faulty and should be replaced or repaired if parts are available. Rebuild kits are available for some pumps. Contact an application engineer at Campbell Scientific for further assistance. Why might a water sampler controller not retain its programs? It may be that the internal battery in the controller needs to be replaced. Remove the four screws from the front of the keypad, and check the voltage of the internal battery. The internal battery is a 3.6 Vdc battery. An indication that the internal battery may be failing is if the charge is down to 2.9 Vdc and if entered programs are not stored in memory. Replace the drained battery with a fresh one, but ensure that the sampler is plugged into a power source with the power on to keep the new internal battery from discharging. 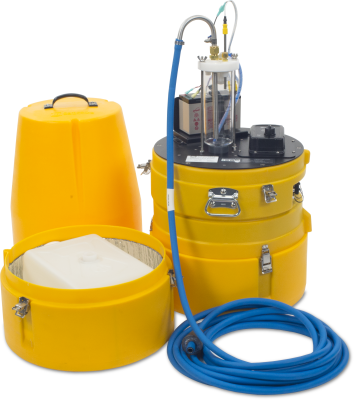 How can data be communicated from the water sampler to an offsite location? When a data logger is used with a water sampler, historical data can be stored, and complex calculations can be computed. When a third component, a communications peripheral, is interfaced with the data logger, then the data and calculations can be transmitted offsite automatically for viewing in near real time. This information can be downloaded to a computer for extended storage, further analysis, sharing, and reporting.